"The central feature in Lehi's dream is the tree of life—which is a representation of 'the love of God' that is 'most desirable above all things' and 'most joyous to the soul' (1 Nephi 11:22-23; see also 1 Nephi 8:12, 15). "'And it came to pass that I did go forth and partake of the fruit thereof; and I beheld that it was most sweet, above all that I ever before tasted. Yea, and I beheld that the fruit thereof was white, to exceed all the whiteness that I had ever seen. "'And as I partook of the fruit thereof it filled my soul with exceedingly great joy; wherefore, I began to be desirous that my family should partake of it also' (1 Nephi 8:11-12; emphasis added). "The greatest manifestation of God's love for His children is the mortal ministry, atoning sacrifice, and Resurrection of the Lord Jesus Christ. The fruit on the tree can be considered a symbol for the blessings of the Savior's Atonement. 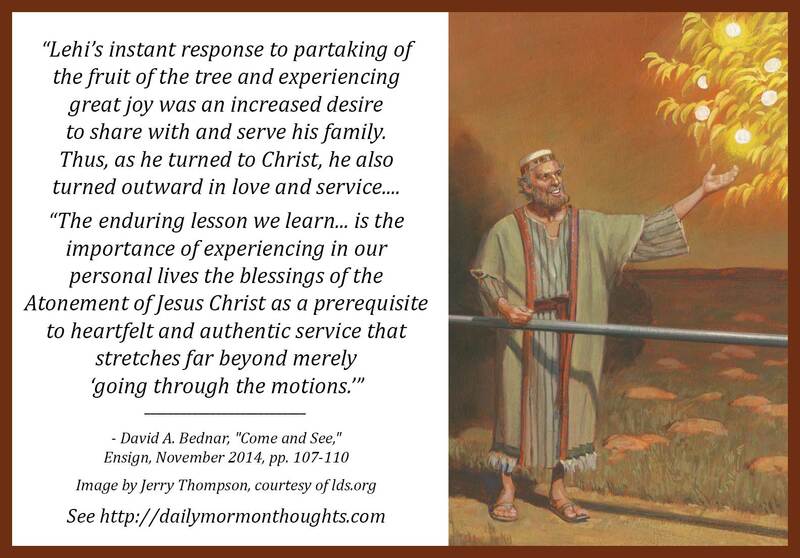 "The enduring lesson we learn... is the importance of experiencing in our personal lives the blessings of the Atonement of Jesus Christ as a prerequisite to heartfelt and authentic service that stretches far beyond merely 'going through the motions.'" Elder Bednar's suggestion is that we, likewise, as we begin to understand and appreciate the sacred blessings of the Atonement of Jesus Christ, will be filled with the desire to serve as He encouraged us. 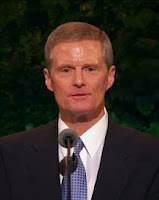 We will respond as did Lehi: "As he turned to Christ, he also turned outward in love and service." This is lovely. Thank you, good sir. Thank you Elder Bednar for this wonderful thought of the day!